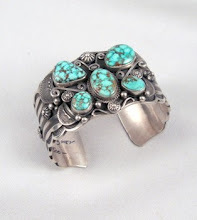 Random Thoughts on Native American Indian Jewelry: What's my old Indian jewelry worth? What's my old Indian jewelry worth? 1. Is it really Native American handmade? Just because it "looks" Native American, doesn't mean it is a truly authentic piece of handmade Native American jewelry. And just because Granny bought it on a trip out west in the 1970's, does mean it was actually made by a Native American. Many tourist traps out west, even at the Grand Canyon, sold Indian "look-alike" jewelry that was actually made in Thailand, China, Philippines, Indonesia, the Middle East and elsewhere. Misrepresenting goods as Indian-handmade is a federal offense, so today most reliable shops will not do so. But back in the early 1970's, when there were no such regulations in place, there were a large number of imports coming into the country that looked like Indian art, but were not. 1-a. Is it handmade or mass-produced? This question is closely related to question #1 above. But the truly valuable Indian jewelry is handmade, not machine made. Was the piece completely handmade or was it made with manufactured components or processes and then simply assembled by Native Americans? 2. What is the piece made from? Is the item made from sterling silver or some other precious metal, like 14 carat gold? Is it stamped "sterling" or "14K"? If not, the item should be tested to determine the metal content. Silver plated jewelry or jewelry made from nickel-silver, German silver, rhodium, or the like is really costume jewelry and hence not as valuable as something made from sterling silver, coin silver or 14K gold. 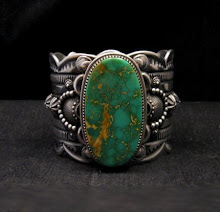 If the jewelry is set with turquoise, is the turquoise natural, stabilized, reconstituted or man-made? From what mine did the turquoise come? 3. Is the item hallmarked by the maker? 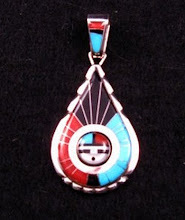 A hallmark is put into the back of a piece of Native American jewelry, pottery, or other craft to identify the maker. To research Native American hallmarks in general, I recommend the following reference books: "Hallmarks of the Southwest" by Barton Wright, "Hopi Silver" by Margaret Wright, "Zuni: The Art & the People Vols. 1, 2,&3" by Barbara Bell, or "Native American and Southwestern Silver Hallmarks" by Billie Hougart. Just because a piece of jewelry is not hallmarked, doesn't necessarily lower it's value. In the early part of the 20th century very few individuals signed their works. But knowing who made a piece of jewelry is one of the most important factors in determining its value. Once you have established who the maker was, you can do a little online research to help you learn more about your jewelry. Obviously, certain silversmiths and jewelers are more popular or collectible than others. The value of a certain artist's work is mostly determined by the marketplace. Sometimes, if the artist is deceased, the value of his work will be higher today than it was when he was alive. But in the case of an artist who is still working today, particularly a Zuni artist who is has been making the same family jewelry for the past 30 years, an old piece isn't going to be worth much more than a new one that you could purchase from the same artist today. 4. How old is it? Sorry folks, but just because your jewelry is old, doesn't mean it is worth a whole lot more now, than when it was originally purchased. The value of Indian jewelry that was produced back in the 1970-80's has not risen significantly over the last 30 years. (Of course there are always exceptions.) 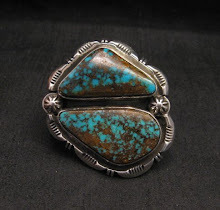 The prices of contemporary jewelry have been rising recently, due to the increases in the cost of silver and the limited availability of high grade turquoise from the old Southwest mines, many of which are now closed. 5. How rare is it? Is this a one-of-a-kind piece? Or is it something that you see all over the Internet or QVC? 6. Condition? Are the stones loose, missing or cracked? Is the silver broken in any spots? Don't worry if the silver has turned dark. This is a normal property of silver. Many collectors like or even prefer the aged vintage patina that gives the silver a warm, mellow coloration. 7. Do you have a written receipt from the place where the item was originally purchased? This will go a long way towards substantiating the authenticity and hence the value of your jewelry. And of course, if the jewelry was purchased directly from the artist, there can be little question as to it's origin and authenticity. Any documentation you can provide (referred to as provenance) will help.